It’s 8:15 am. James is on his way to the office. He doesn’t start until 9 but he’ll bet you anything he has he’s going to be stuck in traffic. At the office, it’s the same old story. Before he can actually get down to work, he’s got to wade through all the unread e-mails in his inbox. As soon as he’s replied to everynone there’s a bunch of new messages. “As if I didn’t have better things to do,” he sighs. Thank heavens, it’s finally lunch time! While munching on his sandwich, Jim’s banters with Jeff from accounting. Jeff always manages to cheer him up. Why can’t he be in his team? Instead he has to put up with that Jennifer. She was supposed to send him an Excel file before she left for her vacation. Did she? ‘Course not. And, as it always is, nobody else has access to it. Just Jim’s luck. He has to finish this report by 4 pm. And now he really has to ace it so the Big Bosses won’t notice the gaping hole where Jennifer’s numbers should be. “Hunker down and work, Jim!”, he tells himself. But that’s easier said than done. The damn phone is ringing off the hook and no five minutes pass without somebody storming into the room. JFK airport is less busy. Many office workers are all too familiar with this story. All they want to do is be productive and deliver their best performance but external circumstances make that tough. 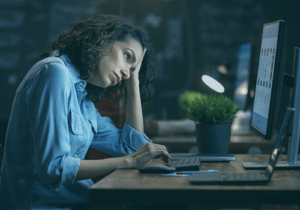 They work in little inspiring surroundings, are constantly getting distracted by others and have to deal with processes that increase rather than reduce their workloads. Frustration is part and parcel of their working days. However, hampered productivity is not the only argument for a new model of work. For there are many other developments that businesses have not caught up with: more and more women are joining the workforce, a healthy work-life balance has become more important to all genders, millennials demand more flexibility from employers. Yet many organizations lack the structures, processes and technology to keep pace with their employees’ demands. Which is why a cultural change must happen in the workplace. Businesses have to switch from the nine to five work model to trust-based work time. From office dependency to an anywhere workplace. From outdated technology to digital infrastructure. From media disruptions to holistic systems. From the traditional to the modern workplace. The modern workplace is digital. It enables employees to work productively, communicate effectively and react quickly at any time, at any place and on any device. It allows them to work according to their individual requirements and preferences. In this workplace digital technologies are the means to achieve an end rather than the end itself. They are the foundation for remote work on the train, in a taxi or from the airport lounge; for homeoffice, for efficient collaboration and effective communication. 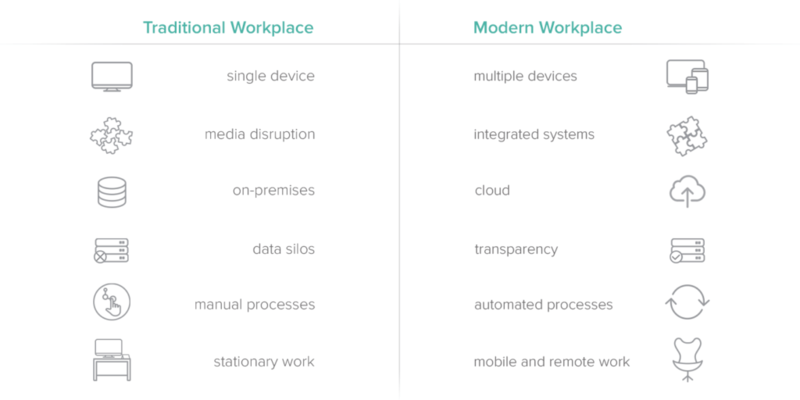 The Modern Workplace has several dimensions. For one it concerns the design of the physical workspace (Microsoft has implemented a creative workspace in its Redmond headquarters). A second important component is hardware: laptops, tablets, smartphones and conference systems replace the personal computer. Last but not least, in fact absolutely crucial, are an organization’s processes. Work must be simplified. And this can be achieved best with software that streamlines processes. Three areas are central to this new way of working. In a traditional workspace ways to communicate are limited: in person, on the phone or via e-mail. Yet all it takes to demonstrate how limited e-mail is is a message with a subject line like “Re: Fwd: Re: Re: Re: Fwd: Re: Brief coordination”. The right communication tool depends on how and how frequently we interact. With customers and other third parties we communicate comparatively rarely and rather formally. This is where e-mail shines. With our colleagues, however, we not only exchange messages much more often, our style is also more colloquial. Knowledge and data silos cost time and hamper productivity. Often when all we want to do is access certain piece of information, we instead have to inquire far and wide about it: “Who is responsible?”, “Where is the file stored?”, “Who has access?”. In the modern workplace, files are no longer saved locally with access restricted to one individual. Instead they are stored in the cloud for everyone involved to access and edit. 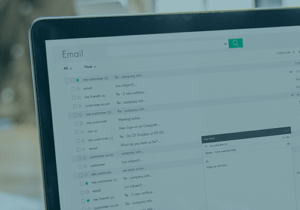 This puts an end to theforwarding files via e-mail that clogs up inboxes. Instead, a simple link suffices. Sometimes external circumstances force us to work outside the office: a work trip, no childcare, train strikes. Other times, we just require a change of scenery. No one can be expected to deliver consistent brilliance when forced to stare out a window at the same lackluster backyard day in and day out. Whatever the reason for our absence from our desk, we still have to be able to work as if we were sitting there. Most people already carry a mini computer with them at all times. They should be able to work it as such, too. Many businesses’ software infrastructure consists of siloed solutions and re-purposed tools. For employees having to switch from one program to another is tiring. And getting the best out of a software that was designed to do something else entirely is a challenge. 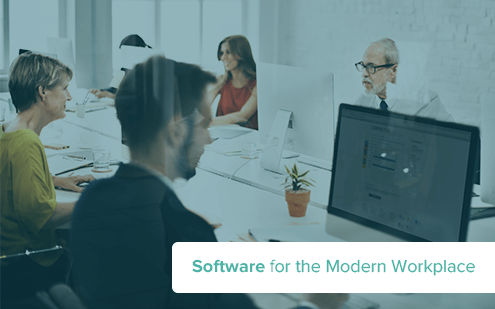 The good news is: Software for the modern workplace not only simplifies licensing and administration for IT departments, it also affordable. Contrary to popular belief, Office 365 is not merely a cloud version of the Office applications familiar to most working professionals. Instead, Office 365 is cloud-based, meaning it includes both desktop applications as well as browser version of those same tools that can be accessed via the Office 365 portal. Which makes is the ideal software for the modern workplace: If you know your log-in data, you can open Outlook, Word, Excel, PowerPoint, OneNote and Access from any web-enabled device, wherever you are. It also includes such services as Exchange, OneDrive and SharePoint. While OneDrive is a personal cloud storage space, SharePoint is a central storage facility for documents that shoud be accessible by several or all employees. It is a data storage center for a department or business in the cloud. Two years ago, a new tool joined the Office 365 family and quickly became the fastest growing business software in Microsoft’s history: Teams. 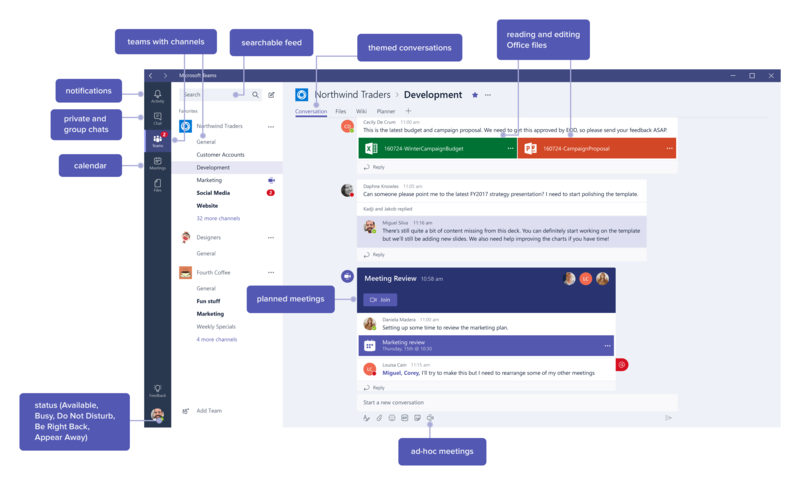 Teams is Microsoft’s competitor product to Slack. The social media like software is the central collaboration space for departments or other teams. 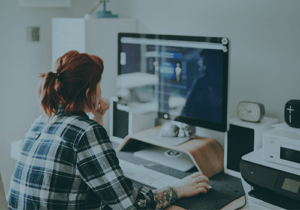 Features such as themed channels, group chats, direct messages, planned and ad hoc video and telephonce conferences with desktop sharing functionality allows users to confer quickly and help stem the flood of internal e-mails. There is also an emphasis on having fun and embracing team dynamics. Likes, emojis, gifs and memes are part and parcel of working with the tool. Mentioning a user (with @username, like in social media) guarantees that a person will see messages concerning them. And since the feed of messages in a channel never disappears, it is always searchable for previously posted information. The big benefit of Teams, when compared to other collaboration software, is the easy integration with Office tools. SharePoint, Power BI, Planner and others can be added to each channel via tabs. Word, Excel and PowerPoint files can be opened and edited without having to leave the programm. Teams also supports dozens of third-party services, such as Trello, SurveyMonkey, YouTube or GitHub. By the way: There is a freemium version of Teams available for small and mid-sized companies with up to 300 users. Businesses that want to implement a modern workplace without much effort should consider Microsoft 365. It is a ready-to-use solution that includes the operating system Windows 10, the productivity and communication tools of the Office365 suite (including Teams! ), and protection against security risks and cyber crimes courtesy of Enterprise Mobility & Security. If you want to learn more about any of the products in this article, contact us. In a personal call, we will answer all your questions.